A worker piles bricks made from recycled construction debris. Up to 100,000 bricks a day are made at a work site in Hangzhou’s Cao’an Village, saving money and waste. Like many communities in the city, Chaoming began a trash-sorting system four years ago. Residents were instructed to separate waste into four dustbins: green for kitchen waste, yellow for recyclable trash, red for toxic garbage and gray for everything else. First, it reduced the number of trash bins to just one green one for wet garbage and set up a recycling site in each neighborhood for all the other trash. As incentive, it gives residents credits that can be redeemed to buy household goods. Today, a resident in Chaoming needs just to throw wet garbage into the green bin and then “sell” all the dry trash, such as plastic, metal, paper and glass, to the recycling center at a price of 0.8 yuan (12 US cents) per kilo. The credits awarded to residents can be redeemed at a store next to the site. So far, the site has collected over 60 tons of recyclable garbage. In some neighborhoods, Jiucang Recyclable Resources provides an app for smart phones, allowing residents to call for dry garbage pickup at their door. They can also use the credits they amass to buy goods at the app’s online store. China’s government is trying to encourage community recycling as a way of reducing waste and tidying up neighborhood environments. In March the National Development and Reform Commission and Ministry of Housing and Urban-Rural Development released a plan “to encourage the collection, transportation and disposal of waste.” More private enterprises are joining in the campaign. At the Liu Shui Xi Yuan community, the Jinxuan Environmental Service Co has initiated the “golden beetle system” to collect kitchen waste. The company gives residents credits for “leftover” foods, which in turn can be redeemed to buy goods at the collection center. The company turns the waste into fertilizer, which it sells. The committee said 127 communities are now participating with private companies in garbage sorting. The local government provides the companies subsidies and low-rent facilities. Even construction debris is included. Cao’an Village, located in the Wenhui residential area of urban Hangzhou, is undergoing reconstruction now. As part of the process, construction waste is being recycled into up to 100,000 bricks a day. At the site, a Shanghai Daily reporter saw machinery carrying the debris to a nearby site where it is pulverized and then turned into compressed gray bricks. Water is sprayed at the site to reduce dust. In the village, there are six construction sites, with a target of recycling 220,000 cubic meters of building rubbish. “The bricks made from the debris can be used in groundwork and walls,” said Hou Bin, an official of the Wenhui residential area. 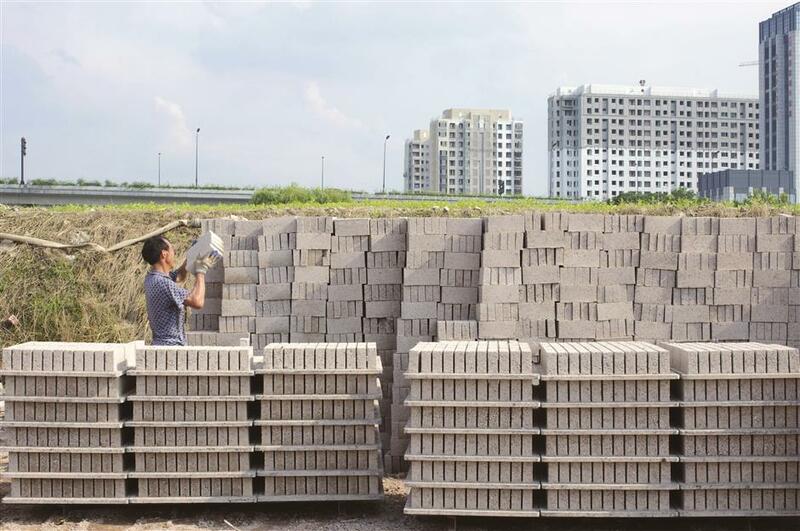 Hangzhou Recycling Environmental Project Co, which has the contract for the recycling, makes money by selling the bricks at half the price of standard bricks.